Waking up at 5 AM on a cold winter morning just to shovel the snow out of your driveway in order to get to work is no fun. If you know what we are talking about, maybe it’s time to consider buying a snow blower. This guide will tell you everything you need to know about the best rated snow blowers in the market today. If you have spent your childhood in an area with heavy snowfall, you probably remember one of those heavy, incredibly loud gasoline-powered snow blowers that took ages to start. Luckily, this is not your only option anymore. Gas-powered snow throwers are now much more compact, quieter, and easier to control. 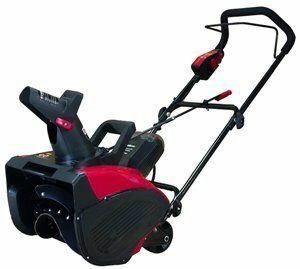 Electric alternatives on the other hard have also become very popular, so you can find a large number of electric and cordless snow blower models. There is a lot to choose from indeed, but we hope our list will help you make the right decision. For those of you who wants to jump straight to our final verdict, here are our top picks. We’ve researched and tested various models from all of the most popular manufacturers. While choosing our top picks, the most important factor was overall performance. 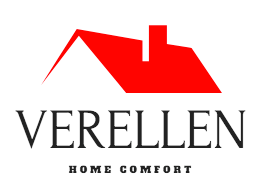 However, we have also considered the functionality, durability and the price in relation to quality. The Squall 208cc from Troy-Bilt makes clearing out the snow easier than ever before. This snow blower features a 208cc 4-cycle overhead valve gas engine. With that much power and 21 inches of clearance width, a snowstorm will never catch you unprepared again. Don’t worry, you won’t have to start the engine by pulling a cord like with older models of snow blowers running on gas. It also comes with an electric starter. A push of a button is all you need to do to get the machine going. The capacity of the gas tank is 0.5 gallons. The engine is powerful enough to clear out 13-inch deep snow. This model also comes with drift cutters included. This is a really useful addition since the drift cutters will allow the snow blower to handle wet and slushy snow with ease. Frozen snow drifts? No problem. Drift cutters cut through the snow that has frozen over and help you direct it into the snow blower. What we liked the best about this model is how functional it is down to every little detail. For example, the swivel range of the chute on this snow blower is 190 degrees which is 10 degrees more than most other snow blowers with adjustable chutes. You can control the direction of the chute remotely using a lever which is easy to reach while operating the machine. The Squall 208cc also comes with a comfortable handle which makes the work much easier on your back. The handle is also foldable for easy storage. This is definitely not the cheapest snow blower you can find, but it’s worth the investment. It’s not too big and not too small. This model is our top pick and we can proudly pronounce this as the best gas snow blower in the market. If you live in an area with only moderate snowfall, you’ll be amazed at how quickly it can get the job done. 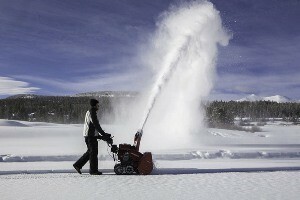 However, this snow blower will show it’s true power in extreme conditions while cleaning snow that is very deep or wet. The only downside is that his machine weighs almost 100 pounds. 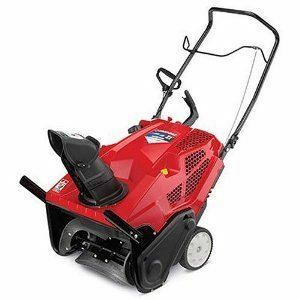 This Briggs & Stratton model is one of the most powerful single-stage snow blowers you can find. 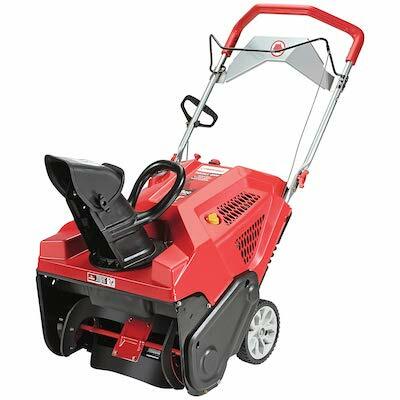 Just like the Troy-Bilt snow blower, it’s powered by a 4-cycle OVH gas engine with a displacement of 208cc. This engine is part of the Briggs & Stratton 950 Snow Series. It has an advanced heat-management system which allows them to start smoothly even at extremely low temperatures. The only downside is that there is no electric start, an old-school recoil start is needed instead. The intake height of this model is 12.5 which is more than enough for handling even the most extreme conditions. It will clear a 22-inch wide pathway in one go which is quite wide for a snow blower of this size. The machine is rather heavy, but it also includes an auger-assist drive system which makes pushing the snow blower around much easier. Basically, the rubber auger is designed a bit differently, so it helps propel the machine forwards while picking up the snow. The oversized controls are also a nice touch since they eliminate the need to take off your gloves. The chute can be rotated from left to right within a 180-degree range. The direction of the chute needs to be adjusted manually using a handle located directly on the chute. This can be slightly inconvenient, but it’s also very easy to do with mittens on. Overall, this snow blower offers great performance even in the most extreme conditions. It also comes with a 3-year limited warranty. 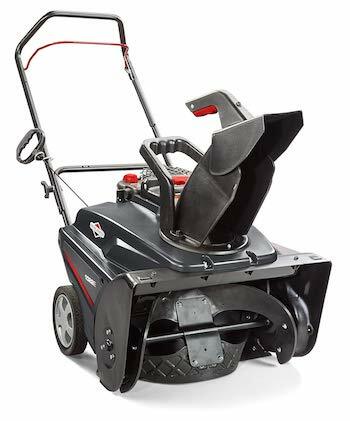 If you are expecting to face heavy snow storms and freezing temperatures multiple times a year, this Briggs & Stratton snow blower might be the right choice. This electric snow blower from Greenworks is the perfect eco-friendly alternative to gas-powered snow blowers. You’ll never have to worry about gas or oil, and there is definitely much less maintenance. Don’t underestimate its power just because it’s electric. The 13-amp motor is capable of clearing out 10-inch deep snow and throwing it up to 20 feet away. With the intake width of 20 inches and a 180-degree rotating chute, you’ll be able to clean your driveway in no time. This snow blower is also less noisy and much easier to start than traditional gas-powered snow blowers. 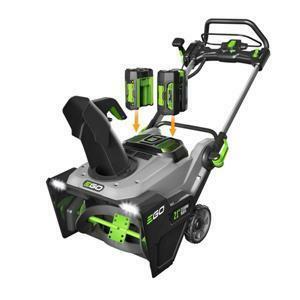 What we liked the most about the Greenworks 2600502 model is the fact that it weighs only 30 pounds. This makes it the most lightweight snow blower on our list. For this reason, it is also very easy to operate. The biggest downside of this snow blower is that it’s powered by a cord, so you need to be careful not to run the snow blower over the cord. This doesn’t have to be a problem, though, especially if you need to clear only a small area. However, you’ll most likely want to purchase an extension cord. Keep in mind that it needs to be an extension cord made for outdoor use with a 13-amp rating or higher. 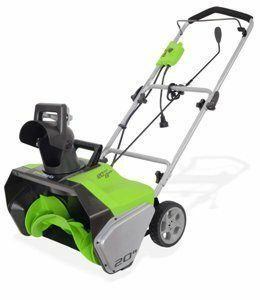 You can buy this Greenworks snow blower with or without a light kit. The light kit consists of two headlights that can be attached to the handle. These are useful but not really necessary. 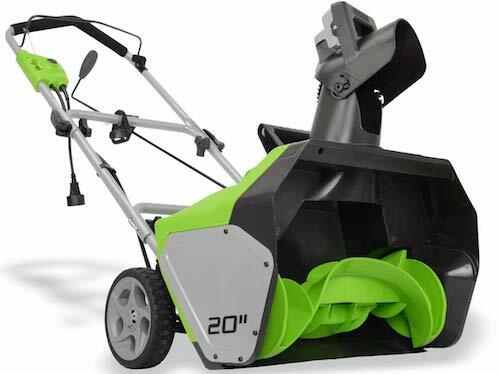 If you really don’t need the massive power of gas-powered snow blowers, this model from Greenworks is a great budget-friendly option. It perfect for clearing out smaller driveways and sidewalks in areas with moderate snowfall. It’s also a perfect choice for the elderly since you don’t need a lot of strength to operate it. PowerSmart makes high-performance snow blowers with generally lower prices than similar models made by their competitors. The DB2401 is one of the best they have to offer. What really makes this snow blower stand out is the fact that it doesn’t need any fuel or cords. You just need to charge the battery, and you’ll be ready to go. The battery in question is a 40-volt Lithium rechargeable type. It will allow the snow blower to operate for about 30 minutes in one charge. 30 minutes will most likely be enough to clean the snow out of a two-car driveway. For larger areas, you’ll definitely need more time so the battery life can be a bit of a problem. However, the battery takes only 70 minutes to charge so you could easily use the snowblower multiple times in one day. The PowerSmart DB2401 has a clearing width of 18 inches and an intake height of 11 inches. The PowerSmart DB2401 snow blower has two big advantages: it runs on batteries, and it’s very lightweight. It weighs only 43 pounds which makes it very easy to operate. If you don’t live in an area with extreme conditions during the winter, the DB2401 might be a good choice. It is also considered to be one of the best snowblower for women. This EGO snow blower is powerful and effective, even on snow that has iced over. The best thing about it? It runs on batteries. 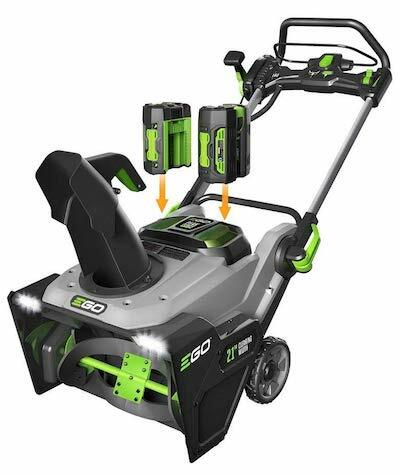 The EGO Electric Snow Blower comes with two 5.0 Ah batteries. According to the user manual, the machine will run for an hour if using both batteries, but we know from experience that they can last even longer. You can also use only one battery if you are cleaning just a small area. This snow blower comes with a Rapid Charger which greatly reduces the amount of time you need to charge the batteries. It will take about 40 minutes to charge one battery. Theoretically, you could just use one battery while you charge the other and you would never run out of power. In terms of performance, the EGO snow blower is very close to gas-powered snow blowers. With a robust chassis and steel construction, it was made for extreme conditions and heavy use. It’s also one of the sturdiest battery-powered snow blowers you can find. Some even considered this to be the best snowblower for gravel driveway. The intake width on this model is 21 inches, and it comes with a standard 180-degree rotating chute. There is a lever on the handle which allows you to adjust the direction easily. What’s unique about this model is an additional handle on the shute which you can squeeze to adjust the speed of the auger. This allows you to control how far the snow is thrown which is very convenient. Finally, this cordless snow blower comes with two bright LED headlights. They are located in the front, and they are really useful if you are working in limited visibility conditions. If you are looking for a cordless snow blower and don’t mind spending a bit more money, this EGO snow blower will certainly not disappoint you. The powerful performance combined with long battery life, what more could you ask for? What a good snow blower needs to do is pretty clear. It needs to clear the snow. However, with such a wide range of models with different features available online, shopping for a snow blower can have you feeling like you are shopping for a new car. So how to choose? Before you start browsing, you should ask yourself a couple of questions in order to understand what to look for. What is the size of the area you need to clear? 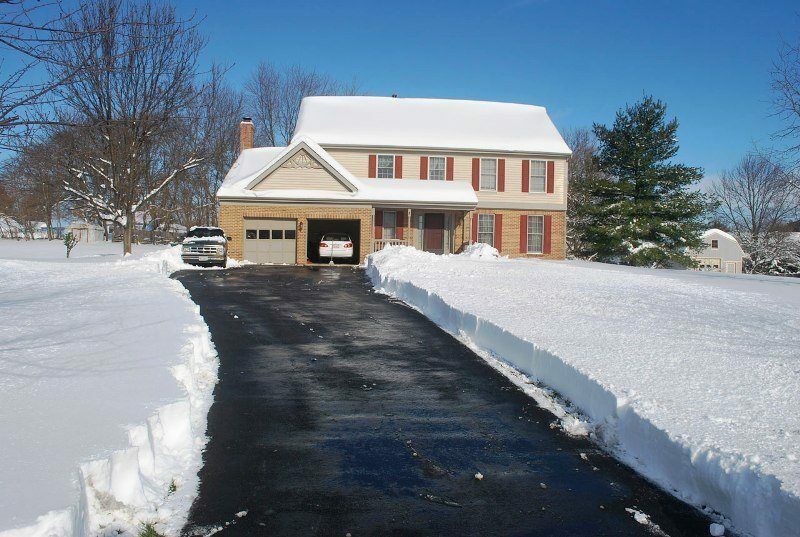 Consider the length and width of your driveway and any other areas you want to clear. If you only plan to clear a small area, almost any snow blower will do the job. However, for long driveways and big yards getting a more powerful unit might be advisable. The climate you live in is also a very important factor. What kind of snow will your snow blower need to clear? Is it just occasional light snow or heavy, wet, or frozen snow? Where do you plan to store your snow blower when it’s not in use? Once you have the answer to all of these questions, it’s time to start looking for the perfect snow blower. The most important decision when buying a snow blower is choosing between gas-powered and electric. Traditional snow blowers have been gas-powered, but electric alternatives are becoming more and more popular. 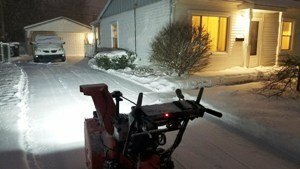 Electric snow blowers work best in areas with light to moderate snowfall. They are generally less expensive and more lightweight. They are also more compact which means they require less storage space. This makes them perfect for people who need to use their snow blower only occasionally. Electric snow blowers will either be powered by a cord or by batteries. Various manufacturers use different types of rechargeable batteries for their snow blowers, but Lithium batteries are the most common. In the end, it all comes down to personal choice. Gas snow blowers can be very powerful, and they come in various sizes. There are single-stage, two-stage, and three-stage gas snow blowers. Electric snow blowers, on the other hand, come only in the form of a single-stage snow blower. Single-stage snow blowers are the simplest type. They operate using one auger which scrapes the snow off the ground and sends it up through the chute. These snow blowers are usually recommended for areas with moderate snowfall. This type of snow blowers will be able to deal with the average snow depth of 6 inches with ease. However, many of them can handle even more. 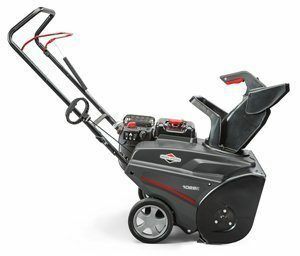 Our top pick, the Squall 2100 from Troy-Bilt, is powerful enough for 13 inches deep snow. Single stage snow blowers are made for driveways, sidewalks and other small areas. They are very easy to use, although most of them work only on flat surfaces. This is because the blades of the auger of these blowers come directly in contact with the ground. Single-stage snow blowers are smaller and lighter than two-stage and three-stage snow blowers which is a big advantage. If you are dealing with moderately deep snow, a snowblower that’s too heavy will only slow you down. Many models also feature a compact design for easy storage. If you have limited storage space and/or you don’t plan to deal with extreme conditions, a single-stage snow blower will most likely satisfy your needs. Two-stage snow blowers have an extra part called the impeller. It’s a fan-like device located behind the auger that throws the snow out. With three-stage snow blowers, there is another auger added to make them even more effective. These machines are much more powerful than single-stage models, so collecting densely packed or frozen snow is no problem. They also stand higher from the ground compared to single stage snow blowers. This makes them perform better on uneven terrains such as dirt or gravel. Two-stage and three-stage snow blowers are generally much larger and heavier. They have wider clearance and taller intake heights. These machines are much more robust and more difficult to maneuver because they are made for professional use. They are designed for large areas and high-capacity jobs that need to be done quickly. For this reason, they are too big for typical household needs. The amount of snow a snow blower can process at a time will depend on how strong the engine is. The first thing you’ll need to decide is whether you want a gas-powered or an electric engine. We’ve covered the pros and cons of both types earlier in this guide. If you have decided to go with gas, you have two options: a 2-cycle gas engine or a 4-cycle gas engine. Many people avoid 2-cycle engines because they require you to mix oil with gasoline in exact amounts. Any electric snow blower can be started with just a push of a button. When it comes to snow blowers that use gas, it’s a bit different. All older models have a starting mechanism much similar to that of a lawnmower. You start them by pulling a cord. Fortunately, recoil start is no longer your only option. Many models now have an electric start which means you start them with just a push of a button. The clearance width is the width of the path your snow blower will be able to clear in one pass. The wider the clearance, the lower the number of passes you’ll need to clear an area which also means you’ll need less time. However, wider snow blowers are also bigger and heavier which makes them harder to maneuver. To get an idea about the clearance width that’s right for you, consider the width of your driveway and how many passes you will need to clear the area. The intake height indicates the snow depth the machine will be able to handle. Intake heights start from 4 inches on the most basic electric shovels while the largest, professional-grade snow blowers have intake heights of 2 feet or more. The intake height you will need on your snow blower depends on how much snow you’ll have to deal with. Consider how deep the snow usually gets in your area and go a few inches taller, just to be safe. Throwing distance is especially important for wider driveways and wide areas in general. Being able to throw the snow further away makes the process much easier. The throwing distance generally depends on the strength of the motor. Most single-stage snow blowers will be able to throw the snow up to 20 feet away, but some models can reach even bigger distances. The chute is the part through which the snow blower discharges the snow. Almost every snow blower comes with an adjustable chute, but the way you control the chute varies from model to model. On the most basic models, you’ll need to adjust the chute manually. There is usually a handle on the chute itself which allows you to move it from left to right. Some more advanced models come with automatic chute controls. They usually have buttons which allow you to control the direction of the chute. Automatic controls are more convenient, but they are also much more likely to break down at some point. Some snow blower models come with headlights. This is a very useful addition. Since the days are shorter during the winter, you’ll most likely find yourself clearing the snow in the dark at some point. It doesn’t matter if you like to do it in the evening or in the early morning, the visibility will probably be limited. Having headlights on your snow blower will make the work easier and safer in such cases. 1. What is the best time of year to buy a snowblower? The best time of a year to buy a snow blower is August and September or late summer due to much lower prices. 2. What's the difference between single and two stage snow blowers? A single stage snowblower uses a lightweight auger that is effective against light snow. Two stage snowblowers are designed for heavy snow. 3. How long does a snowblower last? A snowblower can last between 3 and 5 years with proper maintenance. In most cases, if used with care they can last even longer. Finding the perfect snow blower can really be tricky. You don’t want to get a snow blower that’s too big or end up with one that’s not powerful enough. If this is your first snow blower, we highly recommend the Squall 208cc from Troy-Bilt. It’s reasonably priced, and there is no way you will be disappointed by the amount of power it offers. Jeremy is here to help you get the right tools and equipment for your yard and garden. Being obsessed with them for almost a decade, he knows how important quality and reliability is when using them. For this reason, he will focus on creating and sharing content that not only cover the latest information and trends but also his insights on the best products that will suit your needs and requirements.